When he explained why – he was obeying voices in his head — people thought he was crazy. Isaac, one of NASCAR’s greatest drivers, eventually ignored the voices and resumed racing. In 1977 during a Late Model race at Hickory Speedway Isaac collapsed and died on pit road. He had suffered a heart attack. I was reminded of the eerie Bobby Isaac story earlier this week when a Dutch bobsledder dropped out of the Olympics. He said he was too scared to go on. He is 33 with a wife and daughter. He was spooked by the earlier death of an Olympian luger in a crash. One national sports columnist called him a quitter. How shameful. I’d like to see the columnist wedge his pampered fanny into a bobsled and go screaming down that icy chute with his life flashing before his eyes. Nobody has the right to label someone else a coward – especially someone who has never faced fear himself. The bravest of the brave can reach their breaking point. I saw it happen during my days as a combat infantryman. The jungle can be a scary place, especially after you’ve lost a buddy or two. The same applies to a bobsled chute or a racetrack. When Talladega Superspeedway opened in 1969, drivers were jittery about the unprecedented speeds on the giant 2.6-mile track. They worried that their tires wouldn’t hold up under such torture. They could imagine what would happen if a tire exploded and slammed them into a concrete wall at 200 mph. Simply put, they were scared. The Professional Drivers Association, led by Richard Petty, discussed the situation and decided not to race. NASCAR boss Bill France Sr. brought in backups to take their place. Does that mean that Petty and the other drivers who refused to race because of safety concerns were “quitters?” Of course not. They went on to race again, risking their lives in other races on other tracks. 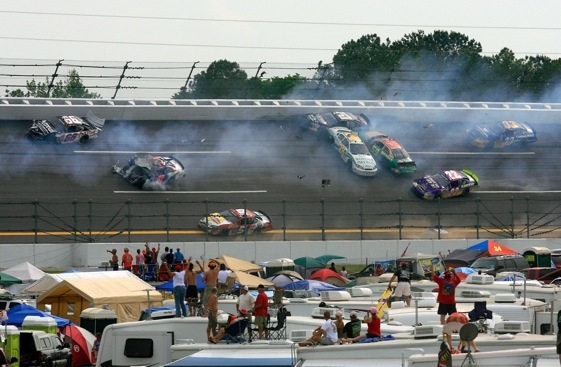 But on that particular weekend at Talladega they became spooked by the monster track with its monster speeds. That day brave men chose to walk away. The Olympian bobsledder made the same choice. It’s his life and it’s his decision whether or not to risk it. Nobody has a right to question it. I agree totally. Have been involved with local racing for many years and have seen drivers “walk away”. There is no disgrace in my book when some one realizes that it is wise to get out. I stooge on a team where the driver called it quits in the middle of a season that was going well but one wreck put everything in a different perspective. He owns the car. I believe that Bobby Isaac died in the hospital later that night, not on pit road.